As products of the public school system, we’ve always been fascinated by those who’ve been home schooled. 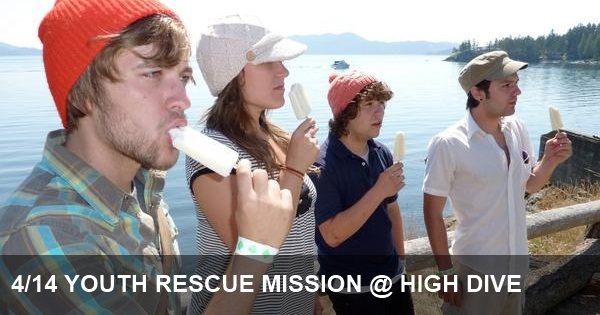 Our level of intrigue has reach a new peak with tonight’s High Dive headliner Youth Rescue Mission. Much to our surprise, the bandmates are also all siblings who’ve been learning and playing together off and on since their not-so-distant childhood. Back story aside, the newcomers to the Seattle stripped-down indie folk scene who played their first official show in late 2009 won us over immediately. With lovely harmonies, a touch of Americana rock and the baroque instrumentation characteristic of the chamber pop genre, they produce dreamy, elegant songs that are hard not to fall in love with. Thinking back on it, maybe avoiding the Freaks and Geeks-like experiences the rest of us went through is what gives Youth Rescue Mission the ability to tap directly into those positive emotions we hear so much about. All that home-learning might also explain their harmony-heavy cover of Reading Rainbow theme song you can listen to on their MySpace page. Otherwise, we’re guessing they’re just big Levar Burton fans. Who isn’t really? Don’t miss them tonight at The High Dive in Fremont with Smokey Brights and Sean Flinn & The Royal We. Yes, they are fabulous! However, for the record, I know a few of these wonderful musicians also attended public high school.